If you can overlook the tired face, messy hair and depressing parking lot backdrop, you'll see that I'm wearing an outfit! And, no, that is not the same plaid shirt as the one seen in my previous two posts. I'm not a one-trick pony, I promise. The button-up is not what I want to talk about, anyway. It's the sweater that's new and exciting! At the Weardrobe Conference, the bloggers got a chance to meet representatives from Gilt Groupe, a members-only website that offers designer items at a major discount for limited windows of time. While I've done plenty of browsing, this sweater is my first purchase! Sweaters, in my opinion, are the most important type of garment this time of year. My collection was in desperate need of an update, and I love embellishment, so this little number won me over right away. Haven't checked out Gilt? Use my invite code! Your sweater.... OHMYGOD. I'm in love. I love that sweater and was so bummed that it was sold out by the time I got to it. Poo! You are doing it some serious justice and look awesome! Wow I love this whole look, it's just perfection! I want that sweater! That sweater is the perfect touch! I love it so much! Love this look! That sweater is gorgeous, just the right amounts of glam and slouchy! that sweater is gorgeous! good choice. I love your sweater! Great! nice shirt! I have a similar in grey colour. LOVE LOVE LOVE this outfit!! It is just soooo perfect!! 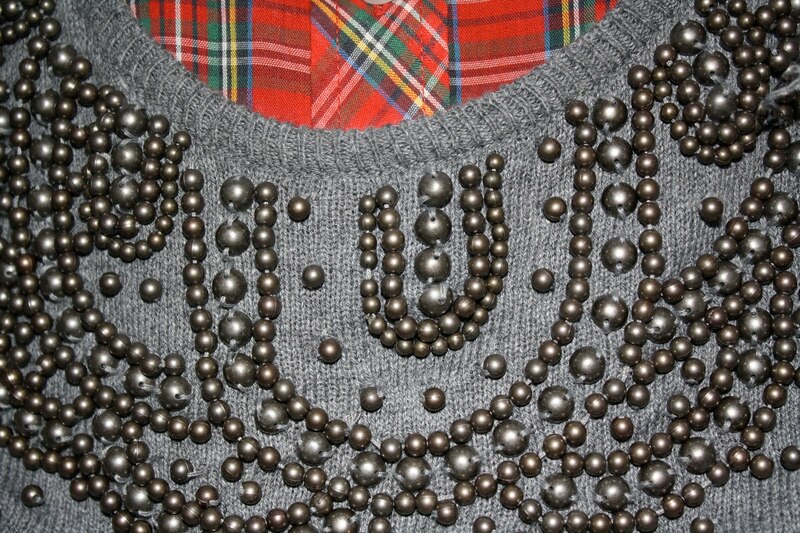 This sweater is very adorable and gives it a feminine spin to the masculine plaid shirt. I love this outfit. You look awesome. I love that shirt with that sweater and I really like your bangs pulled back, although I am super jealous of your bangs in the first place!!!! This outfit is frickin' amazing. Wow. 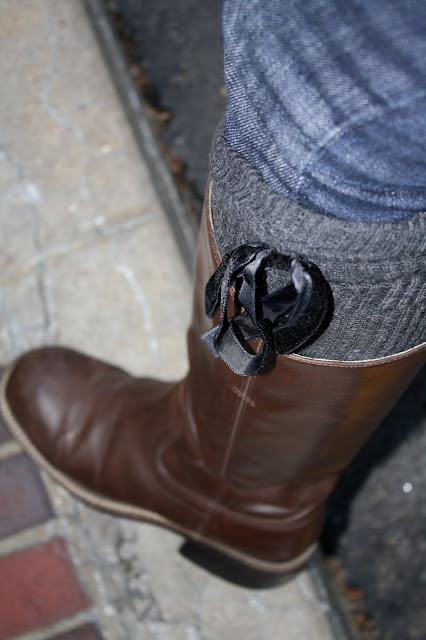 I love the tall socks/boot combo! I've been in love with that look ever since I watched the movie "The Edge of Love." Sienna Miller and Kiera Knightly rock some of the best outfits, and the best part is that their characters are supposed to be rather destitute, so they are pretty easy to replicate. It's the inspiration for my winter wardrobe this year, and I recommend checking it out! I love the plaid/pearl combination - well done. I like it when you repeat items - it is more inspiring that way! I don't think of it as a one-trick pony at all! I just want to say I LOVE LOVE LOVE LOVE your blog. It is completely and utterly in my top 5. I completely heart your style. And I ADORE how you get your clothing so cheap!! I think adding how much things cost is something I will add to my blog. It is just so fun for me to read the good deals you get! Also, this outfit is FANTASTIC. I give you 6 thumbs up (one from each member of my family). This is definitely one of my favorite outfits that you've worn!